ENGLEWOOD, N.J.— As anyone who has spent time in a hospital emergency room will tell you, they are as much about paperwork as they are about patients. Yet there’s often precious little time for filling out forms when bodies are stretched out on gurneys in need of immediate, sometimes life-giving care. That’s a challenge Laserfiche is helping to meet at New Jersey’s Englewood Hospital and Medical Center. 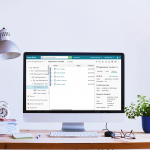 The document management software is breaking new ground in the every-second-counts world of emergency hospital health care, an industry that will take all the help it can get in this age of HMOs. “I really like this Laserfiche system,” said Dr. Stuart Caplen, Englewood’s chief of the department of emergency medicine, where Laserfiche is now being married to the existing medical records management software. What started out a year ago as an experiment in Englewood’s billing department has earned Laserfiche a place in the fast-paced, no-time-for-mistakes world of the emergency room. Doctors and nurses will soon get instant access to everything from X-ray reports to EKG’s the same way accounts receivable got faster access to invoices and insurance claims. “They needed a system to be nimble and compile records quickly, with an emphasis on workflow,” said Dan Lundy of JPI Data Resources, which is overseeing the Laserfiche installation. Laserfiche ended up in the Englewood E.R. only after proving itself elsewhere in the hospital, according to Maryellen Osborne, Englewood’s director of health information management. She said she and her 40 staffers debuted as the software pioneers. Before Laserfiche, a discharged patient’s billing file would make the rounds of various hospital records repositories. They would linger for days on administrators’ shelves while copies were distributed to billing departments, insurance companies and various other cogs in the health care wheel. The next stop was a year’s stay in hospital filing cabinets before moving to off-site storage for the next decade or so. Tracking down a patient’s record that has served such a sentence – a crucial, constant task in the day-to-day function of the hospital – could be difficult, Osborne said. All that started to change when the company that managed Englewood’s off-site records storage facilities started using Laserfiche. Suddenly Osborne’s staff could access those off-site patient files more easily than the records on-site in hospital filing cabinets. Recognizing that this kind of software could work miracles with the hospital’s on-site record keeping, Osborne gave Laserfiche a trial run last October in her office only. And she only scanned emergency room admissions and treatment files, which are much smaller than their in-patient counterparts. They committed to using Laserfiche for document storage and retrieval purposes only, keeping hard copies handy in boxes nearby just in case. Hospital emergency room billing records were now being found and dispatched faster than ever before and the system was a hit around Osborne’s office. But a major hurdle remained. Laserfiche breezed through that particular exam, with the records provided by the new system offering advantages over simply storing the original. There was also no concern about another all-important hospital mission – maintaining privacy. Laserfiche’s Audit Trail functionality keeps track of who accesses which patient records, when, and for how long. Then there are the dollars and cents. Not only does Laserfiche reduce the need for expensive off-site storage, but Lundy points out that a lost record is an unbillable one. After several months, Osborne was finally ready to let other departments in the hospital access the Laserfiche system her offices had been enjoying. Her first beneficiaries were Caplen and his assistant. “They, of course, immediately fell in love with it and thought it was the best thing since sliced bread,” she said. For Caplen, who as the boss needs routine access to patient records, it was primarily about the ticking clock. Within the last month she granted system access to the equally thrilled business office supervisors, and so far everyone finds themselves getting better records faster. Now they’re in the process of bringing all the emergency room doctors and nurses into the loop. This is a major step, not just because E.R. doctors and nurses will be able to get the Englewood history of an in-coming patient without any complications, but because of the E.R.’s own complicated record-keeping system. Hospital staff use an electronic version of T-System for admissions, while treatment is documented on paper by the various health care providers involved. Laserfiche is being asked to seamlessly adapt this hybrid system into a unified electronic file and make it instantly available to the countless people and entities that will eventually need it. “Laserfiche was really the only way to get immediate access to the whole chart,” said Caplen. The success so far has Osborne making more plans for other outpatient departments, eventually hoping to tackle all in-patient record-keeping for the 600-bed hospital.